An enormous map of the Western USSR in 1941 is under development for ‘Operation Barbarossa, the Complete Organisational and Statistical Analysis, and Military Simulation’. Below is a snapshot of a huge map of the Western USSR being built for military simulations and scaled at 2.5km per hex! It is being constructed by Jack Bechtold in the US using the 1:250,000 scale topographic maps located at Texas University. The maps were compiled from German and Allied sources dating between 1930 and 1946 by the Army Map Service in the mid-1950s. 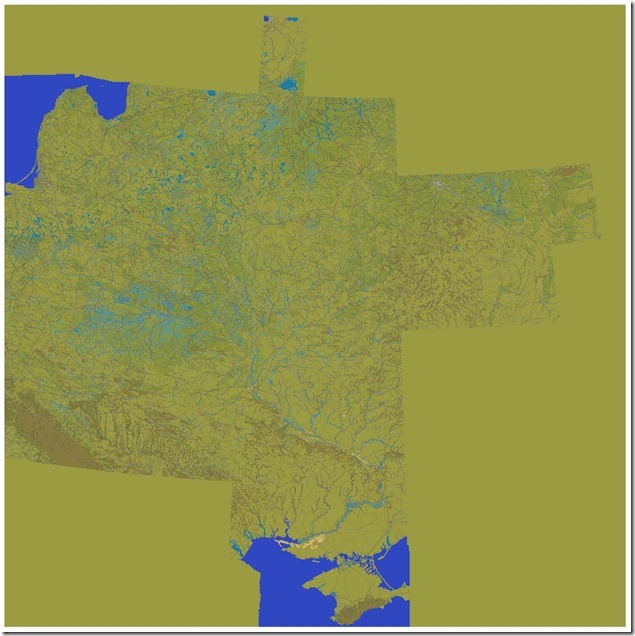 The map sections were pieced together using Jasc Paintshop Pro 8 and Corel Paint Shop Pro 6X. The hex grid was applied using Opart Design and Debug 4.0 by Curt Chambers. The sheer scale and historical accuracy of this map is breathtaking. It will allow, for the first time, a completely realistic simulation of Operation Barbarossa down to even company level. At this scale, each division’s units would almost never be able to defend in a simple line, but would have to be deployed in depth. I.e., each division would be forced to defend a ‘front area’, which is what it had to do in reality. At larger simulation scales (say 7-10km per hex) the simulation player can simply deploy divisions in a line without worrying too much about the ‘depth of the defence line’. The large scale of the simulation effectively does this automatically. However, at 2.5km per hex we have to think about the actual deployment of the division’s components along and behind the ‘front-line’ to some depth. This is actually a very big leap forward in realism terms because each divisional commander will have to consider how to best use the terrain to defend their sector; both in terms of breadth (i.e. the line) and in terms of depth (immediately behind the line). This is the type of problem faced by the historical divisional commanders. Failure in this area can lead to very weak front sectors and rapid enemy breakthroughs; despite there apparently being large numbers of divisions defending a ‘front-line’. This scale also enhances realism in many other ways, including: more realistic localized artillery and air support, more realistic command and control (C & C), more realistic supply and logistics, and more realistic levels of cooperation between divisional sub-units. For example, at larger scales whole divisions usually cooperate with each other easily. However, in reality it took a considerable amount of staff work, and C & C, for a division’s battalions to cooperate with a completely different divisional HQ at short notice. At 2.5 km per hex this type of cooperation problem can be better simulated (as some armies performed this type of flexible C & C function much better than others).